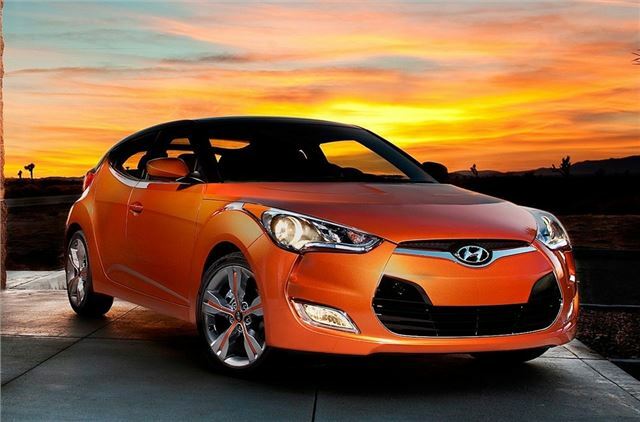 Hyundai has taken the wraps of its new Veloster three-door coupe, which made its official debut at the 2011 North American International Auto Show. Due to arrive in the UK in August 2011, it is based on the Hyundai i30 and will share the same engines. More details will be released when the Veloster is shown at the Geneva motor show in March, but it's expected that entry-level cars will be fitted with 1.6-litre petrol engine with 138bhp while the top of the range model will use a 205bhp turbocharged version of the same engine. It will also come with Hyundai's new six-speed double clutch gearbox. But the biggest talking point of the is the three-door bodystyle. Designed to differentiate it from other coupes, it has a rear door on the passenger side for added practicality, which Hyundai says will give safe and easy access to the spacious interior. There's even a hidden door handle so that the neat lines aren't spoilt. The styling follows Hyundai's recent ‘fluidic sculpture' look and the Veloster has black windscreen-pillars along with Hyundai's now trademark hexagonal front grille. At the back there's a distinctive glass hatch and centre-mounted exhaust to complete the sporty look. In Europe the Veloster will benefit from Hyundai's industry-leading Five Year Triple Care package that includes a five-year unlimited-mileage warranty, five years' roadside assistance and five years of vehicle health checks. Prices and specification haven't yet been announced, but it's aimed to compete with the likes of the Renault Megane Coupe and Volkswagen Scirocco, so a starting price of around £19,000 would seem about right.